Liberal House members just unveiled H.R. 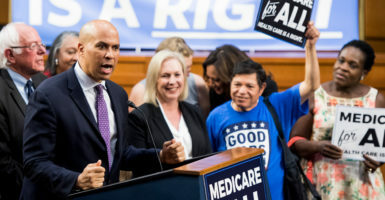 1384 – The Medicare for All Act of 2019, which has 106 co-sponsors. This comprehensive bill threatens to abolish virtually all private health plans – including employer-sponsored coverage – and impose total federal government control over Americans’ health care. Heritage health care expert Bob Moffit briefed Senate staff members this week as a guest of the Senate Republican Policy Committee. He explained to them why this bill is highly authoritarian, unrealistically expensive, and would surely replicate the pattern of long waiting lists, care delays, and denials that British and Canadian citizens struggle with in their own single-payer health care systems. How do you think we should respond to Medicare for All? Just because the government is obligated to pay for many, those with Medicaid and Medicare, they should not get involved with paying for those with their own plans or who choose not to participate. This is a classic case to the camel with his nose in the tent. Medicare for all is an delusion for all Americans. The fact is we cannot afford this kind of healthcare and rationing will be common and deaths will occur because of the long waits . Would you want a government run national car insurance program that would require every car owner to buy their insurance through that monopoly? Kill it in the Senate, or veto it. Any Republicans who consider voting for it should be blacklisted and primaried. Cost prohibitive! Some people would clutter up medical facilities for trivia that a bandaid could fix. Serious problems likely would be delayed too long. We not have staff enough to even attempt such a venture. The Democrats are out to destroy the USA and it’s Constitution. This is just one example. We fully object to these government bureaucrats having their hands into all issues and destroying all that was good for workers under the guise that they know better. We worked hard for SS and Medicare all our lives and do not need it taken from us because of some lame-brained politicians. Things would be far better if they would stop taking their bribes from pharmaceutical companies and reduce medicine prices that we have to pay and which keep going up. Our medical costs are over $8000 dollars per year after Medicare, secondary insurance, and help from my company. We are most fortunate that our doctors will work for the peanuts that Medicare pays them. People are crazy if the think that they will continue in the medical field if everyone is on Medicare! Medicare should be for American citizens only and only the ones it was intended at that. The government needs to keep their hands off what isn’t theirs to give and mind their own business! This is an indication of the mindset of the Dems. They are in control whether it is in their interest or not. Flex your muscles and jack your jaws ’cause we are making the decisions. Forget the people who are being so called represented by the elite. Most of the discussion I hear relates to government take over and, of course, that would be disastrous and unaffordable. But the elimination of private medical practices and the quality incentives they have would be even more catastrophic. It would virtually eliminate all the incentives for individuals to invest the time and money to become medical professionals leading to massive shortages of doctors. No good can come from a “single payer” system. pitch, just a wish for the best for all, but ending up in practice with health care for no one and bill for all. It is unthinkable! God have mercy upon us. Cost is not the only barrier. We will have bureaucrats decide who gets treated and who does not. There will be weeks, months, and even years for simple procedures. Can you imagine only about 10 or so MRI sites in the US? Where will we – like Canadians come to the US for treatment- go for procedures? Ask yourself how Medicare for all will impact the hospital system? Many hospital chains will close within 90 days. They will not be profitable. I suspect this may involve 60 to 90% of the hospitals in the US. Will this lead to a system to government run hospitals? Wow, we can have VA efficiency for all. Here’s a fact to consider; jobs in the government reportedly pay 15-17% more than the private sector for comparable work. Also a government run health care system would leave no one with an incentive to look for cost savings and efficiencies. Competition is good for all industries. A government-run health care system would produce better outcomes and keep costs down? Let’s get real!! Get info on costs and outcomes of medical procedures around the country. Then inform people on insurance costs and types of coverage. Make it available to all via the internet. Let people choose what they want – catastrophic coverage, more inclusive coverage, a plan for people with pre-existing conditions. Etc. Ask Americans – would they rather be told by bureaucrats who don’t know them and have no motivation to prioritize coverage, other than buying votes., to make decisions or individuals meeting their own needs? Everyone deserves medical services for their needs; however, those who have never contributed do not deserve to dip into these services. Such a thing would further break the bank and place a heavier burden on those who can least afford additional financial burdens. We need to educate the people! We need TV ads that quickly and clearly explain what Medicare For All will do to THEM. There will be staff enough. Non quality govt minority workers will take the place of compassionate, intelligent individuals who are hard working and caring. Let the Health Policy HOLDERS make their very own decisions. Keep the hands of the Governmnet out! No MINOR is mature enougj to bave that needed Intllectual Maturity and full KNOWLEDGE to cast Votes that will CAUSE the change of serious issus within our nation! Since it eliminates private insurance, convince those wealthy sources to do the fighting to save their own businesses. goverment should be less involved–what is in place for medicare should have a committee of five composed of a honest cpa,doctor,a person with knowledge & understanding of insurance,priest or very religious individual, & head of committee who is fearfully indendent a free thinker who will truely have people first money second !!!! I hope my family in illinois & wisc will get involved!!! We screwed up last time (during the ACA) by responding with “but the US system is so great!”. People liked their own plan but didn’t like the overall system (somehow). I think we need a 2-step approach, first we have to destroy hope that this proposal will work. It’d be handy to have a pithy expression like, maybe, “if you like your doctor, too bad” to remind people of prior promises made and broken. And then we on the right need to get serious behind 3-4 proposals and start running them through a “funnel” to develop a majority on our side to present so it’s MfA VS SOMETHING SPECIFIC. Just another step toward putting the life of Americans into the the hands of the federal government, to wipe out medical insurance and but the cost into the burden of the federal government. This would destroy over 150 million people who participate in current health care policies and Medicare. This is another disaster. Why do we continue to screw up what is working for the 10% that don’t have a plan regardless of the problem. Let’s focus on the problem for the 10% and not destroy the existing healthcare system. First the cowardly Republicans should have had this taken care of two years ago and we would be on the path to serious healing across the nation now, but they can only focus on replace rather than get rid of Obamacare….truth….they like having control and they want to keep it…. The government should not be involved in healthcare at all. Let me find and pay my own Dr., let me find and pay for my own insurance. When you add the government, you pay a third time to a source that knows nothing about either. The Democrats say we can’t afford 5 billion for a wall but 39 billion is okay because they want to control one more aspect of our life. As soon as they get this through they’ll start pushing on immigration and we will have millions more people added to country and welfare rolls. Why do we persist in throwing out systems, like healthcare pre-Medicare, that worked for almost everyone, except a small minority of hapless individuals for a system that doesn’t work for almost everyone and for which we have no control of the costs or quality? We’re stupid! I think the American people are to smart to fall for all these ridiculous statements by a bunch of foolish rookies trying to get attention. PLEASE DO HELP THE CONGRESS REJECT HEALTH CARE 4 ALL. = WE DO NOT NEED THE USA GOVERNMENT TELLING US ALL HOW TO LIVE AND B HEALTHY. WE WHO CAN PAY 4 OUR HEALTH CARE DO NOT HAVE THE $ TO PAY FOR ALL WHO DO NOT KNOW HOW TO WORK. A very bad idea. Who wants the government dictating your choices for medical care. The government has enough to do without taking on this crazy chalenge. No Medicare for all!! We should have healthcare that is affordable, but insurance does not guarantee healthcare when insurance refuses to pay for something or tells you you have to do A,B or C before they might cover the treatment you and your doctor have agreed on. No illegal or legal non-citizen should be getting taxpayer funded medical care. They are getting Medicaid, food stamps, etc. No wonder our govt cannot guarantee American citizens they will have social security or Medicare beyond 2036 ( I think that was the year. Unsustainable … and medical intervention will turn into something that would be intolerable … unless, of course, we become ill between 9a -5p … and no one gets sick on weekends. And how about the billions of dollars going into all the scientific cancer cures? Will these cures come into effect the same time the Medicare for All kicks in?? Isn’t forcing a group of people to work for one employer a form of mild slavery. Medicare for all forces all medical care workers to work for the federal government. People will find this lack of freedom and choice oppressive. Slowly they leave (or refuse to go into) the field of medical care. 5 to 10 years after passage, there will be shortage of medical care workers. This shortage will get worse as time goes by (those left will be overworked). I agree with all point on Supreme Court maintain at(9). Health care maintain private system. Less government control. Push down to state and local decision. Please remind others that Medicare as it currently works is losing physicians. The result is that the program we were forced to buy into is no longer providing us with the medical care promised. When physicians opt out of Medicare the medigap policies we also purchased do not cover those expenses. Now the government is expecting a program we will also be forced to participate in to improve medical care. They do not understand that Medicare for All will continue to lose medical professionals of a caliber patients would prefer. Ask physicians what they would recommend so they may continue to practice the medicine they studied and worked so hard to provide. Complete government control over everyone medical care? How well has that worked for England? How well has that worked for our own V.A.? Months of wait, poor services, etc……..
At least Glennda had some kind of a plan to look at. We’ve had ins run healthcare, govt run healthcare, neither has worked. We need provider choice, not someone picking winners and losers. Providers should not have third party interferers(govt, ins companies, AMA, FDA) telling them how to provide healthcare. We also need to make healthy lifestyle choices to prevent most pre-existing conditions. HSA could be helpful. If you can’t afford medical care, look for local assistance first, govt last resort of assistance. People care about others, even give to Go Fund Me accounts. Lots of money wasted on elections and legislature, politics. I think medical service costs should be much more uniform: my wife just had endoscopy and endoscopy, Total billing $12,500. But we are on medicare and have extra insurance leading to “adjustment” of $10,500. So, billing before any insurance payment becomes $2,000. How can such a difference be justified? $12,500 vs. $2,000 for the same thing? A friend of mine has diabetis and needs supplies every 3 months. In california, she paid $250. She moved to Washington State and paid $150. Now she lives in Nevada and pays $15 (yes, $15). Such price differences are unacceptable in my opinion. We should fix that before considering any other change: we need similar cost to all for same healthcare services.. I thought obama care was such a great health policy. Now the dems say its so bad they want to rewrite our whole Democracy. Medicare for all is the worst idea ever. I don’t want the Government to handle my health needs. Big brother watching over us all and regulating our health needs. Look at our Postal System and see a government run failure. They want to regulate our life and death—it has already begun–look at NY — killing live babies . The government should not get involved with those who have their own plans. Medicare and Medicaid for those who need help and are American citizens should be continued. and improved. There needs to be a better check and balance.as people and doctors abuse the plans by being dishonest. Do it the way the Heritage foundation suggests in the recent video!!!!! I can’t understand why anyone is in favor of government control over American health care. This would be the ultimate monopoly. History has shown us what happens when a private industry has total control of services or products. it would be even worse the let the government have the monopoly. What has the government ever done efficiently? Just look at how its done with the veteran’s administration as proof of how in-efficient the government is at serving our veteran’s medical needs. If you can’t educate the people on LOCAL TV stations, the 16 year old’s will be voting on the P and VP on that picture above this article soon. I’m on medicare, bot my wife and son are on Horizon Blue Cross and Blue Shield of New Jersey, and this the only way I want our health insurance to be like. I’m against socialized medicine. I’m willing to pay for my family’s insurance.